Tiina Booth sat down with Bill Nye The Science Guy to talk about his storied history playing ultimate frisbee. Bill Nye The Science Guy catching a disc in an ultimate game. I just returned from the 40thCornell Ultimate Reunion and was lucky to meet and interview Bill Nye the Science Guy. 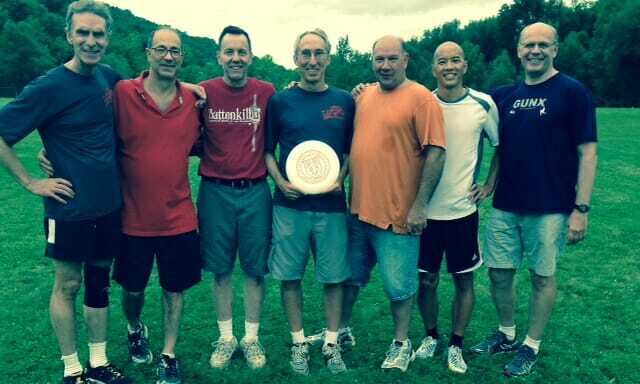 Bill was a member of the first Cornell Buds, a team that was started by Jon Cohn of Maplewood, New Jersey in 1973. Jon graduated from Columbia High School and brought the sport he learned in the NJ parking lot to the Dust Bowl of Cornell’s University Halls. Bill learned all he could from Jon and eventually brought his talents west to Seattle. 1. He played Frisbee Football before Ultimate. 2. One of his fond memories is playing under the lights in Amherst. 3. He founded the Olympic Windjammers, the first men’s team in Seattle. 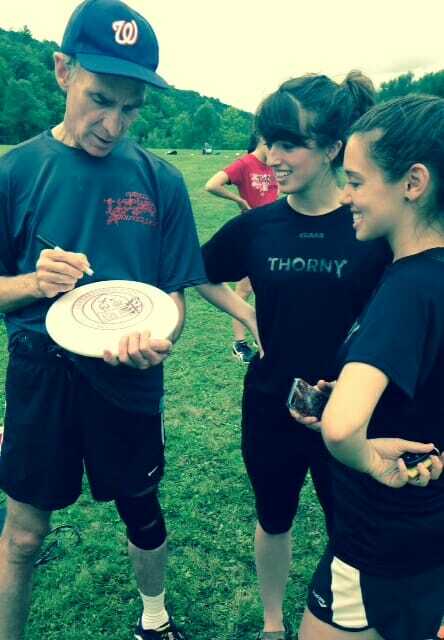 Bill Nye signing a disc for some Cornell Roses players. 4. He was a part of the early Seattle vs. Portland rivalry. The Windjammers’ main competition was the Dark Star of Portland, a team that ruled the Northwest in the late seventies. They also traveled to Santa Barbara and Vancouver and once flew in two private planes piloted by friends from Boeing. 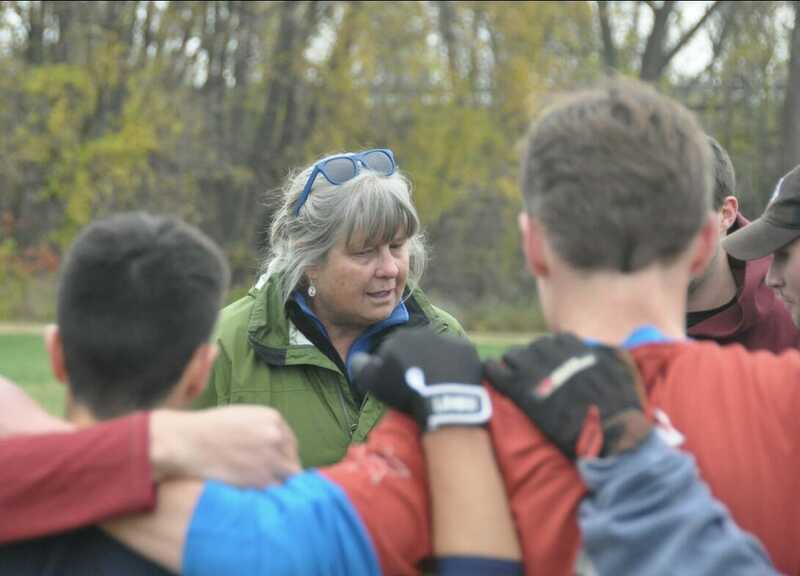 “We played a lot in the rain and the mud in Seattle.” They also played halftime shows in the King Dome for the Seattle Sounders. 5. He had some serious ultimate injuries. Bill suffered a dislocated shoulder, which “has never really been the same” and a broken nose while playing, one that he believed to be retaliatory for an earlier play. 6. He remembers the old rules. 7. Why he likes ultimate as a player. 8. Why he likes ultimate as a scientist. 9. He likes the idea of professional Ultimate. 10. He’s not concerned about the commercialization of the sport. Some members of the founding Cornell ultimate team. From left to right: Bill Nye, Joe Reina, Chip O’Lari, Jon Cohn, Karl Barth, Toby Lou, Don Eibsen. 11. He deeply appreciates his parents and his time at Cornell. 12. He played some serious ultimate at the reunion game. Bill Nye on his love of ultimate. Bill Nye throwing a forehand. He was exuberant and curious and delighted in the connections he found between the past and current generations, and could not have been more accommodating or gracious. He was — in every respect — Bill Nye the Ultimate Guy. Comments on "12 Things You Didn’t Know About Bill Nye, The Ultimate Guy"